To develop an Art Master Plan with a contracted art consultant for the Trolley Trail, a six-mile multi-use linear park planned between Milwaukie and Gladstone. 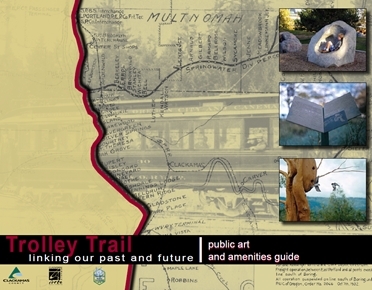 The Trolley Trail Public Art & Amenities Guide will provide background, standards and guidelines for future Trolley Trail Art Steering Committees who select artwork for the Trail. It will also serve the purpose of directing the selection of benches, bollards and other Trail amenities to create a cohesive “look” along the 6-mile path.